This page HOUSES a 14-page report produced in 1916 by US Marine Corps Intelligence Officer First Lt. Ross E. Rowell synopsizing the most salient characteristics of the Conservative-controlled Nicaraguan military during the years of the "first" US occupation (1912-1925). Commissioned by the War College Division of the War Department, the report is accompanied here by a series of maps that graphically illustrate the information it presents. Click HERE or on the image at right to access the PDF file of the report (9.7 MB; the original report is housed in Record Group 127, Entry 38, box 26). One of the things this report makes clear is the extent to which politics & patronage infused the Nicaraguan military at every level. As commander of the nation's armed forces, the president appointed every officer in the military. Presidential political appointees such as jefes políticos (departmental governors) also served as military leaders (comandantes de armas) in their zones of jurisdiction. Jefes políticos, in turn, appointed their underlings to serve as mayores de la plaza (municipal chiefs of police) and local judges (jueces de mesta and jueces de cantón). Not included in Rowell's report was another layer of authority emanating from the Ministerio de Hacienda (Ministry of the Treasury), which had its own groups of armed men charged with collecting local taxes and preventing smuggling & contraband (such as illegal grain-alcohol distilleries, known colloquially as cususas). At the local level the exact lines of authority were cross-cutting and opaque, and depended on the precise configurations of political power in specific instances. Compare the 1916 troop distribution graphic to the 1929 military organization under the Guardia Nacional. Under the Guardia's new structure of authority, after 1929 military "areas" were wrenched apart from the political jurisdictions to which they had corresponded in the century since independence from Spain in 1821. After 1929, the nation's military was no longer under the under the direct authority of the president of the republic, but instead of the Jefe Director of the Guardia Nacional. The latter, at least constitutionally & in theory, was under the authority of the president (much like the chairman of the Joint Chiefs of Staff serves under the authority of the US president) — but in practice the structure allowed for the Guardia's Jefe Director to control & wield a base of power wholly separate from the president's. Predictably, this reorganization created conditions ripe for a coup d'etat by the chief of the Guardia — which is exactly what happened in 1936, when Jefe Director Anastasio Somoza García ousted President Juan B. Sacasa, engineered the presidential elections in his own favor & essentially made himself constitutional dictator. 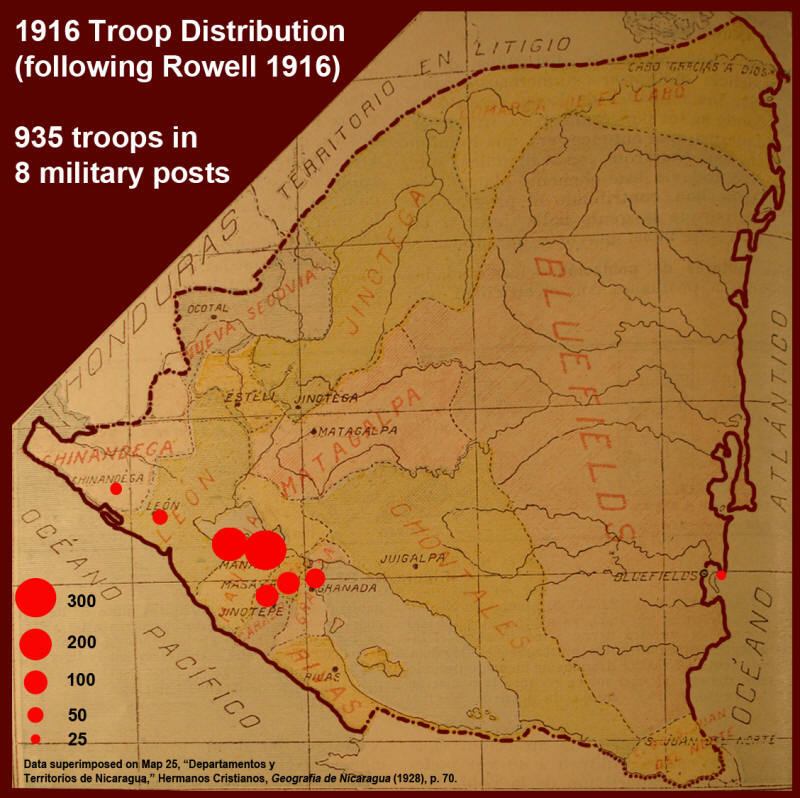 What this report shows, in short, is that before the creation of the Guardia in 1927, military power in Nicaragua was radically dispersed and decentered, with the military capacities of the central state mediated through local & regional powerholders and based, at bottom, on hierarchical but reciprocal relations of political patronage & clientage. It shows what the Guardia, as a "non-partisan" national army, was intended by its architects to transcend. 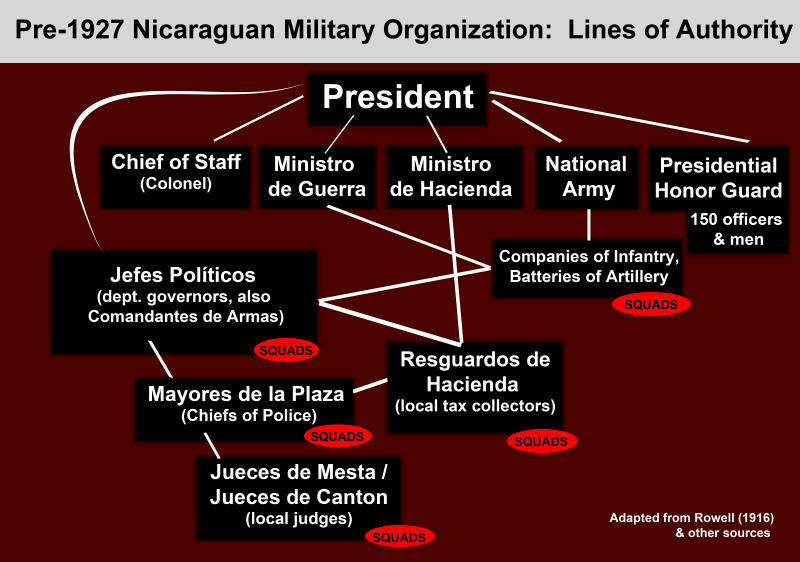 The following graphic illustrates the organization of the nation's military and the lines of political & military authority expressed in this report. 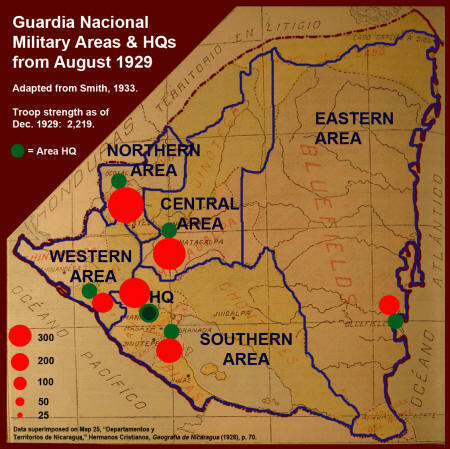 The following graphic places the 1916 map next to another map showing the Guardia Nacional's 1929 reorganization into military "Areas" (Northern, Central, Eastern & Southern), with headquarters in Managua.